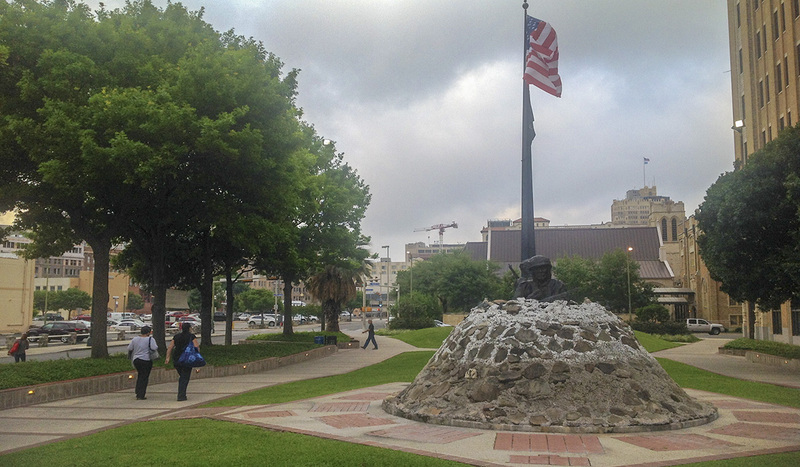 Established in 1986, the one-acre rectangular Veterans Memorial Plaza was built on a portion of a 5.6-acre tract of land reclaimed from the San Antonio River to construct the San Antonio Municipal Auditorium, ca.1917. 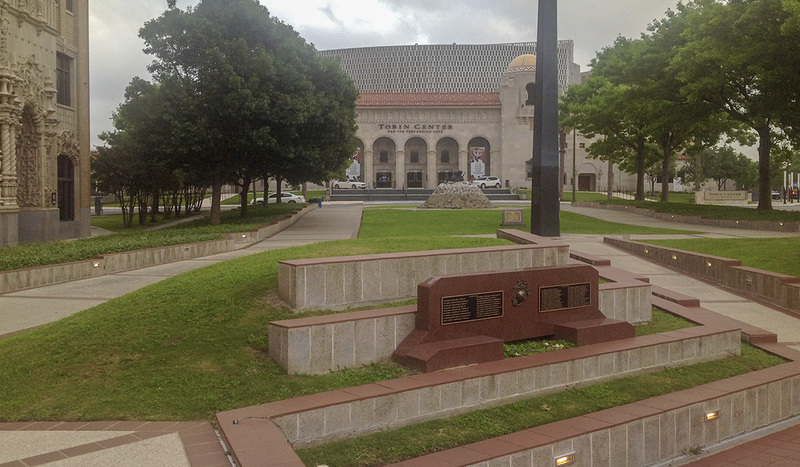 Several postcard views and photographs from the late 1920s to the early 1980s depict the site as an integral part of the auditorium complex and aflush with symmetrically arranged seasonal plantings. 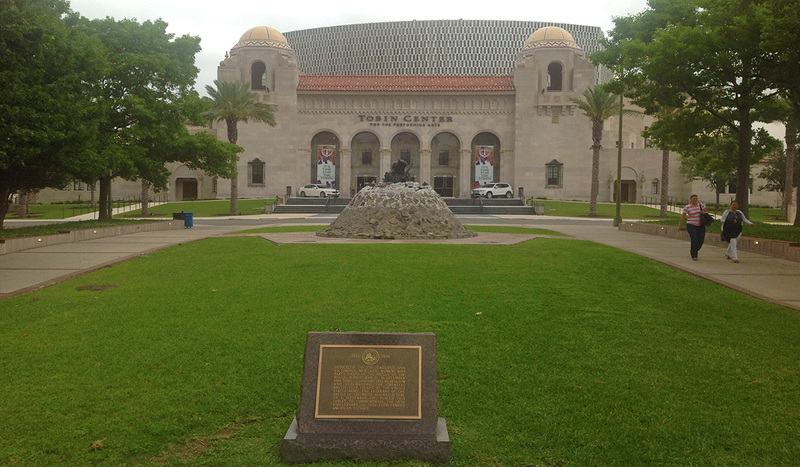 On the plaza’s northern central axis is the San Antonio Municipal Auditorium (listed in the National Register of Historic Places in 1981 and known today as the Tobin Center for Performing Arts), which itself was established as a tribute to World War I veterans in 1926 and rededicated to all veterans in 1981. 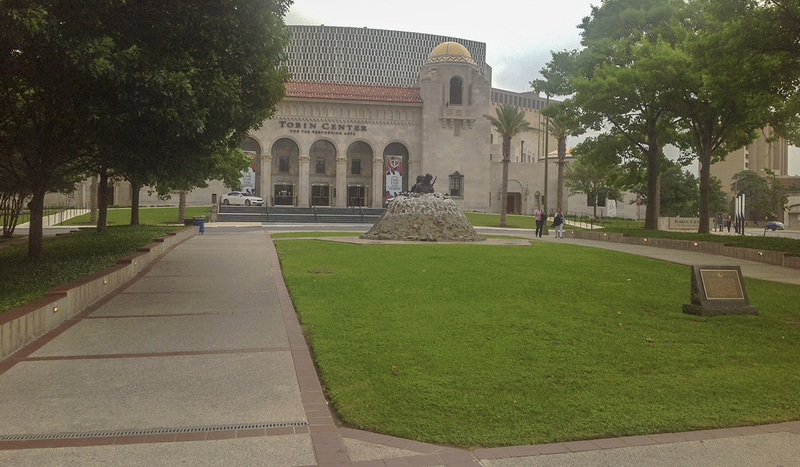 The plaza is also bounded by a Spanish Mission-style high-rise to the west, a parking lot to the east, and Saint Mark’s Episcopal Church (listed in the National Register of Historic Places in 1998) to the south. 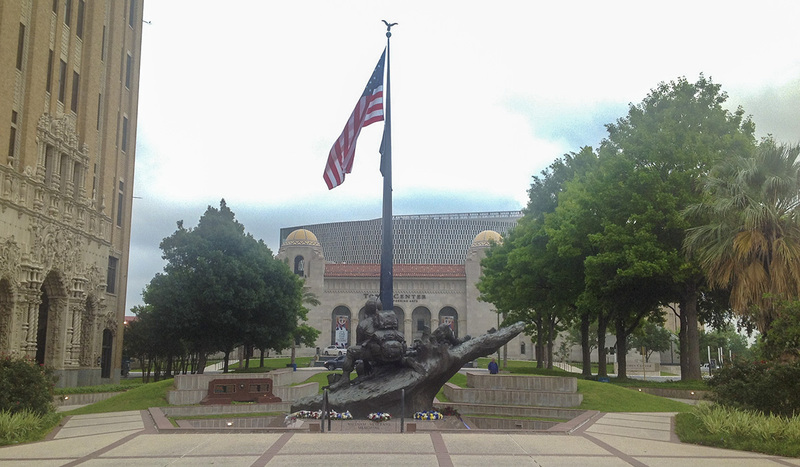 Situated on the landscape’s historic north-south axis are two statues on either side of a 65-foot-tall flagpole, all placed on pentagonal Modernist platforms to represent the five branches of the military. 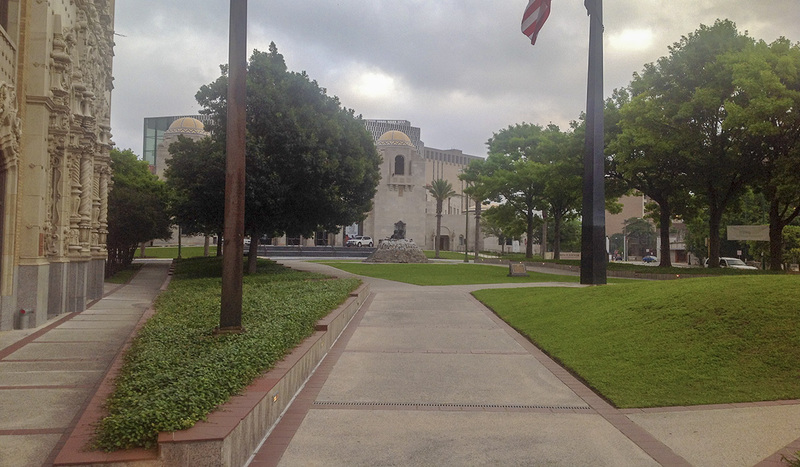 Two parallel, brick-lined paths, each flanked by manicured lawn and pin oaks, descend slightly from the north side of the plaza before diverging at the flagpole (located just south of the midpoint) to reach the southern corners of the site. A bronze sculpture titled Hill 881 South, occupies a slightly sunken trapezoidal space at the central, southern terminus. 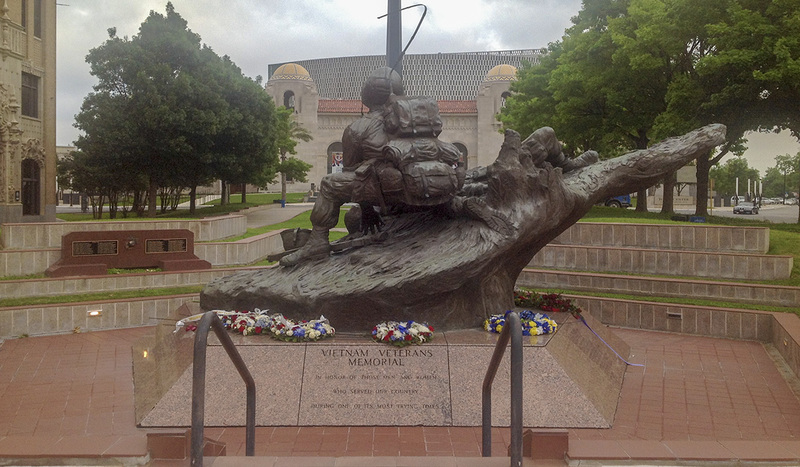 Designed by Austin Deuel, it depicts a soldier tending to a wounded comrade. A poem by Lieutenant David Rogers, titled “Death at my Door,” is inscribed at the base of the statue. 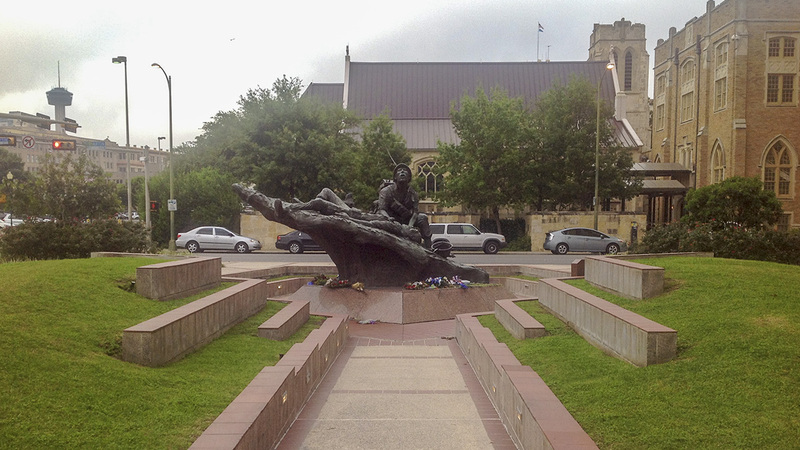 A bronze-and-concrete sculpture, Night Watch, stands to the north. Designed by Jonas Perkins, it depicts two infantrymen in a snow-covered foxhole during the Korean War.